It’s payday! Collect the bounty you’ve earned. Collect the bounty you’ve earned. This is a very fortunate card! If it appears in your spread, the good times are basically here. And your efforts, your careful strategizing, and your blood, sweat, and tears made it possible. KUDOS!! Compliments, attention, and success will come to you now. The golden apple is a magic symbol of good energy and abundance that continues to flow long into the future from the work you have done. You really deserve to congratulate yourself! Say, “Thank you!” to everyone who acknowledges your success, as well as the Universe for delivering the goods. And make sure you thank yourself, too. If this card appears upside-down, your goal is being blocked or is out of reach. There are many reasons this is so: the timing is off, there isn’t the best fit, or maybe you are just trying too hard. Sometimes we exhaust ourselves, believing that we’ll succeed if we work harder, smarter, faster. Instead, check in with the Universe. Is this really the right direction for you now? What is the lesson if you look deeper? 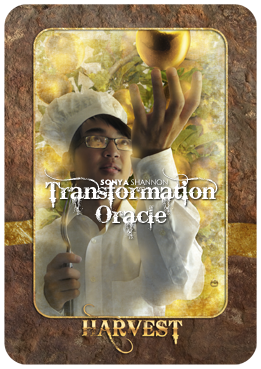 If you’re having trouble getting the message, try another spread such as Past, Present, Future or look to the elements and symbols in the other cards.